After a monster run at huge net additions, the prepaid group somehow fell off a cliff. It's not a pretty sight, is it? After its Leap Wireless acquisition, the company completed the acquisition in 1Q14, the company began to ramp up to expand the Cricket brand beyond the legacy region footprint. T-Mobile's MetroPCS had a similar ramp in growth from 1Q15 to 1Q17. By 2Q17, AT&T prepaid started taking the industry prepaid net add leader. Therefore, AT&T 4Q18 prepaid numbers were a jaw dropper. What happened: Many industry watchers have become accustomed to Cricket as the net addition driving force. However in the traditional cut-throat holiday selling quarter, promotions abounded. 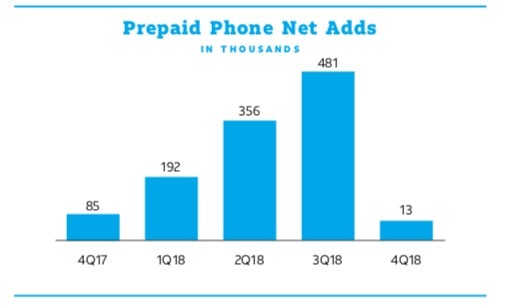 Detailed in the earnings call Q&A, Chairman Randall Stephenson assured analysts that Cricket still had growth momentum with 240K net adds but the branded prepaid side suffered these losses. He pointed to two factors: 1) Branded prepaid subs were moving to competitors' postpaid and 2) AT&T did not want to counter a loss leading handset promotion (A $250 device was offered at $100). As a result the prepaid phone net adds only amounted to 13K. Why it Matters: While AT&T has been disciplined about not getting into promotions that hurt margin, it does impact the view that growth and competition is hurting them in the very visible net addition metric. It's likely that the AT&T branded prepaid loss could factor in the gains at T-Mobile, perhaps both pre and postpaid. 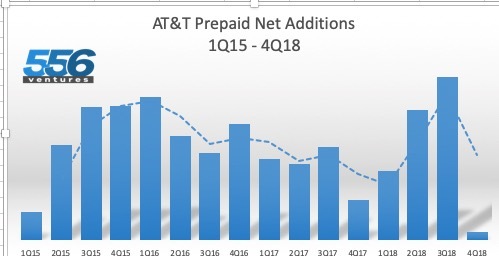 Unless the competition can sustain a loss leader strategy and Cricket growth stagnates, AT&T 1Q19 prepaid net additions should climb out of that cliff. Stephenson has noted glowingly in the past about Cricket's ARPU (~$35) being close to postpaid. Prepaid has been a bright spot over the last two years of growth and revenue contribution, offsetting the declining and handcuffed postpaid side. With more of the same postpaid performance anticipated in '19, prepaid needs to get its mojo back.